Our service on Sunday will begin by celebrating the musical gifts of the children and youth of COS. Prelude music will begin at 9:30 am and may leak into the 10 am worship time a little bit—but that’s ok! An email confirming the lineup for the prelude was sent out today. If you thought your child signed up to play but you did not receive an email, contact Annette or Andrea ASAP! We are not accepting any more prelude musicians unless we mistakenly omitted your name from our list. Prelude musicians can warm up/practice their pieces in the BES space, if desired, on Sunday morning beginning at 8:45 am. All prelude musicians must be in the worship space by 9:30 am, lined up along the wall near the piano in the order they will be performing. Our liturgical dancers are inviting students of all ages and genders to participate in a simple addition to the dance that accompanies the chorus of the song “My Soul Cries Out with a Joyful Shout.” This simple but powerful addition will have a greater impact if more students participate in it. The dance takes place just before the sermon and does not require any special clothing. The dancers will be teaching this new addition during our rehearsal time on Sunday morning, which runs from 8:45am-9:30 pm. We hope to see you there! 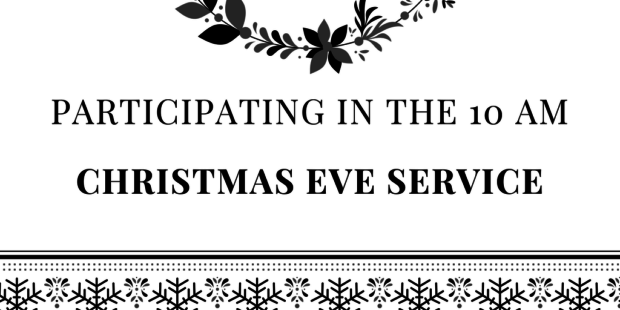 At the end of the service, we will be doing a reading of Luke 2. For this reading, we are inviting children, youth, parents and grandparents to help us create a scene that calls to mind the setting that surrounded Jesus’ birth over 2000 years ago. If you or someone in your family would like to play the role of a shepherd (or a sheep) or an angel, attend our rehearsal on Sunday morning from 8:45-9:30 am. We have plenty of shepherd costumes and a few more angel costumes here at church for participants to use. Costumes have been/will be assigned to participants during rehearsal but won’t need to be “donned” until after communion. Costumes are being kept in the rooms in the hallway behind the mailboxes. If you have attended a rehearsal and plan to participate, go to this hallway after you have taken communion to get into the costume that has your name on it. We look forward to worshiping and eagerly anticipating the arrival of our Savior with all of you this Sunday!